The Keplerian elements are not always the best choice. 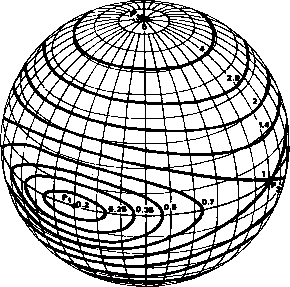 For a hyperbolic orbit, the semimajor axis is undefined and is replaced by the area! velocity, or the area per unit time swept out by a line joining the satellite and the planet (i.e., the angular momentum per unit mass). In addition, perigee (and, therefore, a and M) is poorly defined for nearly circular orbits and the line of nodes (and B) is poorly defined for orbits with near zero inclination. In these cases, alternative parameters and calculation procedures are sometimes used for specifying orbits. Finally, mean orbital elements given in most general-purpose tables define the average motion over some span of time. For precise calculations, it is preferable to use osculating elements, which are the elements of a true Kepleriari orbit instantaneously tangent to the real orbit. Thus, the osculating elements will fluctuate continuously as various forces (e.g., aerodynamic drag, multiple body interactions, or nonspherically symmetric mass distributions) alter the classical shape defined by Kepler's Laws. Summary. Keplerian orbits are not sufficiently accurate for spacecraft ephemerides or for attitude calculations which require a precise knowledge of the position of the spacecraft; however, they are accurate enough to estimate the overall mission characteristics (such as period or altitude) in most regions of space. Table 3-2 summarizes the properties of Keplerian orbits. The normal procedure for adding additional detail to orbit analysis is to treat orbits as Keplerian with additional perturbations produced by any of the various interactions which may be important. Approximations for the most important perturbations are discussed in Section 3.4. Ephemerides based on detailed orbit analysis are described in Sections 5.4 and 5.5.